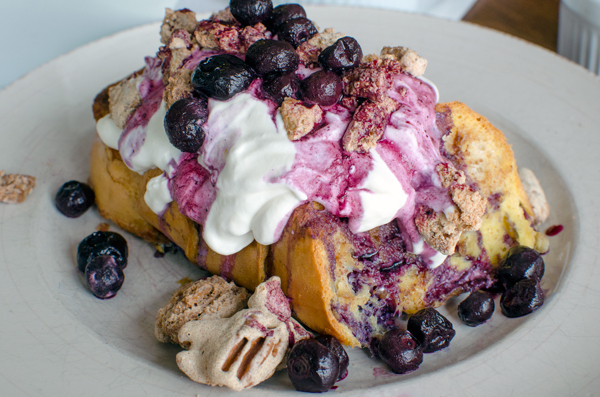 Oh boy, this baked french toast recipe is the stuff dreams are made of. For some reason, pillowy is the best word I can come up with to describe it. Piles of pillowy goodness topped with whipped greek yogurt topping and these incredible candied pecans that have a bit of a meringue-like, well, pillowy, texture to them. Om, nom nom. 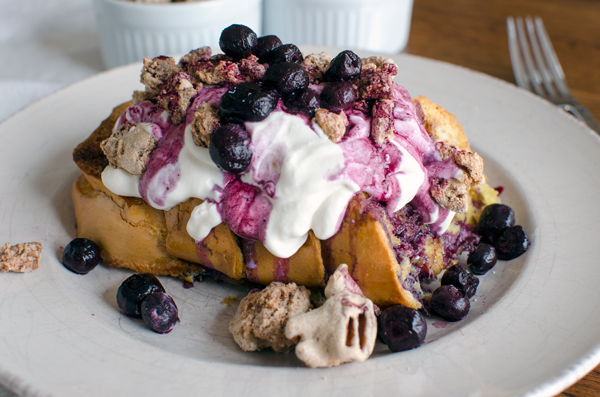 Let’s talk about the whipped Greek yogurt topping. When I first saw the recipe had Greek yogurt in the title, I thought, “Oh great, something healthy to balance out the rest of the dish.” Wee-ell, there’s a 2:1 heavy cream to Greek yogurt ratio in the topping, so, unfortunately, health food is not. Tangy and light and pillowy (ok, that’s the last time I promise) and something I want to slather on everything in sight – definitely. The recipe also has the option of partially being made ahead, so you don’t have to scramble to put the entire shebang together in the morning. It’s great for making for guests, or when you are a guest at someone else’s place in my case. I made this while we were home for the holidays visiting my in-laws. Making it the night before meant I still got to sleep in a bit – I was on vacation after all. The dish was a hit and was obviously part of my master plan to ingratiate myself into their good graces with food. Not that that is needed at all. I’m so lucky to have married into the nicest and most welcoming family on the planet. Going home to Pat’s family has become going home to my family. It doesn’t get much luckier than that. Can be partially made ahead to cut down on cook time the morning of. Cut the bread into 16 or 18 1-inch thick slices. If the bread is really fresh, you can let the slices sit for an hour or two to dry out a bit. Brush each side with oil. In a small bowl mix together the cinnamon and sugar. Sprinkle on top of each oiled slice. Use the back of a spoon to gently press the cinnamon sugar into the slice. Do both sides of each slice. Coat a 9×13-inch baking dish with olive oil. Arrange the slices of bread in the baking dish. In a large bowl, lightly beat the eggs. Add in the milk, cream, vanilla, and salt, whisking until combined. Evenly pour the milk mixture over the bread. Let sit for 5 to 10 minutes, then rotate the slices to ensure even coverage. Rotate back so bread is upright. Optional: Cover the dish and refrigerate overnight. Let sit at room temperature 30 minutes before baking. Spoon some of the egg mixture in the dish over the toast to coat evenly. Bake at 350° Fahrenheit for 30-45 minutes, until golden brown and egg mixture is thick. While the french toast is baking, using the whisk attachment of an electric stand mixer, beat heavy cream on high speed until stiff peaks form. Add the yogurt, sugar, and vanilla, and beat on medium speed, scraping down the sides once, until combined. Let the french toast cool for a few minutes before using a spatula to get it out of the dish. 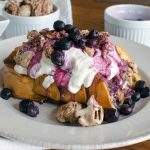 Serve with warmed berries, syrup, yogurt whipped topping and candied chai pecans (recipe below). Whisk the egg white in a medium bowl until frothy. Add the sugar and spices and whisk until mixture is thick and glossy, like a meringue. Add pecans and stir to coat evenly. Spread pecans evenly on a parchment-paper-lined baking sheet. Bake for 30 minutes at 300° Fahrenheit or until golden brown. Let cool. Enjoy as a snack, on a salad or with baked french toast (recipe above). 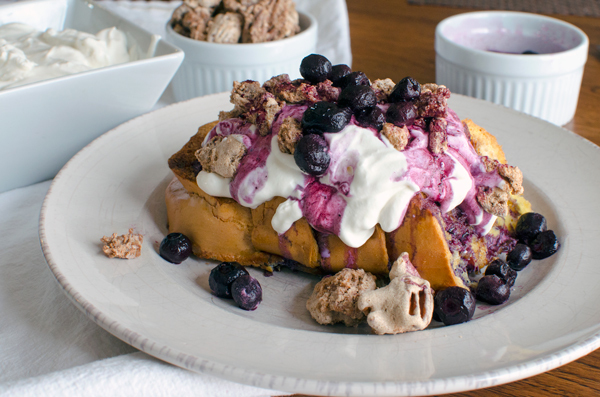 This french toast looks irresistible – and the whipped greek yogurt totally scrumptious! But you didn’t stop there – you had to add those candied chai pecans – I could snack on just those and be happy! Thanks so much for sharing! It really is a bit over the top, I agree! The nice thing is that prepping the night before makes it much less of an ordeal! Thanks for reading! Do you know the calorie total? 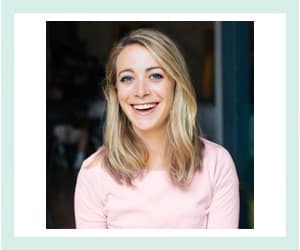 Hi Allison – Thank you for your question. I updated the recipe with nutrition information! The calorie count will vary slightly based on how much whipped topping you use.